Once upon a time there was a Little Blue Duck. Being sad didn't make him blue. He was naturally blue...the prettiest shade...almost a Robin's egg blue and he was tiny, very tiny. Imaging his life, I surmised he lived on a small farm with other "little" animals...horses, cows, pigs and maybe even a chicken or two. Life on the farm was grand because they all gathered, after spending their day in the sunny barnyard, in the old cozy barn each evening to be together. They told stories of their adventures there on the farm. They talked about seeing the farmer riding the tractor and cutting the hay. They were not afraid when the woman of house came to collect eggs, as she was a kind, sweet person. Then one day, one of the little boys, who also lived at the farm, took the Little Blue Duck with him for a ride in the car. The little duck had heard horrible stories about other masters taking their pets for a ride in the country and returning by themselves. He was afraid that he was about to experience that same fate. As he was clutched tightly in the little boy's hand (because that's how tiny the Blue Duck was...small enough to fit nicely into a little boy's hand), the pickup truck (or perhaps it was the blue van driven by the sweet woman) hit a huge bump in the road. The little boy's arm flew up in the air and the Little Blue Duck fell from the young boy's hand right out of the open window. But don't worry, the Little Blue Duck was found by a nice lady and her two dogs as they walked to the top of the mountain one hot humid morning. 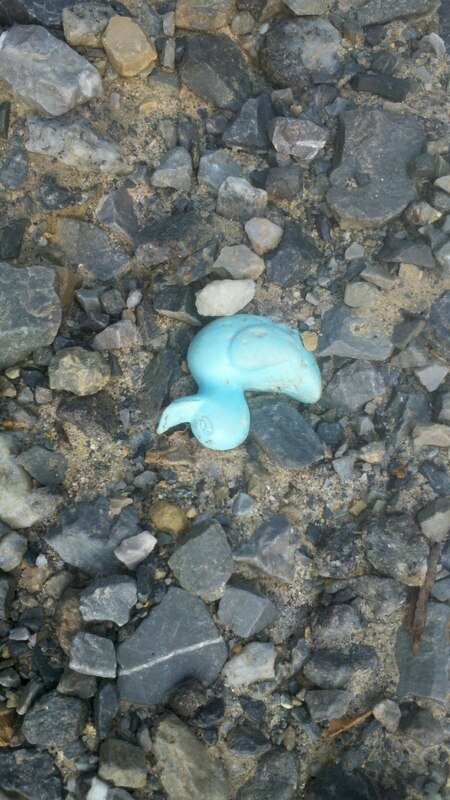 Will the owner of the Little Blue Duck please come by and pick him up. He is here...safe and sound in A Quiet Corner. Whew - you are a duck saver too! And so the little blue duckie started a brand new adventure. I think the little blue duckie found a new home! ...And he lived happily ever after!!! What a cute little story ;-) Lucky ducky got lost and found! You know what's weird? The date on this post says Thursday August 11. Isn't that in the future? Like, it's only Tuesday, right? I don't know why...but I was not getting your blog updates...today..I got about 10 or so updates. Glad to have you back and now I must catch up. if someone comes to claim him...how will you be sure he's really theirs?? cute story!! he's your lucky ducky now! You'll have to put up "Found" notices all around your road! Maybe you'll find the little boy who the little blue duck belongs to! I loved your little blue duck story. I hope the story will have a happy ending when the little boy claims him. 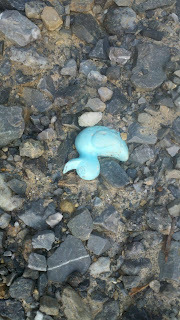 sweet little duck, i am thinking the small child threw it out the window, like my son Daniel did with his pacifier. he was standing (this was before seatbelts) and sucking away and just tossed it out the window. that is how we got him off it, told him it was gone. I like the little blue duck. it looks like one of those that's used in duck races, but I've only seen yellow ones for that. that tomato sauce looks yummy (in previous post). I'm still waiting for my first ripe tomato! have a great day!